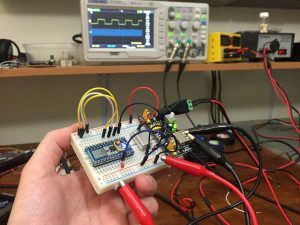 Today I made a high frequency multiplier using a single component: the ICS501 PLL clock multiplier IC. This chip provides 2x, 5x, 8x (and more) clock multiplication using an internal phased-lock loop (PLL). At less than a dollar on eBay, $1.55 on mouser, and $0.67 on Digikey, they don’t break the bank and I’m glad I have a few in my junk box! I have a 10MHz frequency standard which I want to use to measure some 1Hz (1pps) pulses with higher precision, so my general idea is to use a frequency multiplier circuit to increase the frequency (to 80 MHz) and use this to run a counter IC to measure the number of clock pulses between the PPS pulses. I spent a lot of time working with the CD4046 micro-power phased lock loop IC which has a phase comparator and a voltage controlled oscillator built in. It seemed this chip was the go-to for many years, but it requires external circuitry (ICs in my case) to divide by N and is intended to adjust a VCO output voltage based on the phase difference of two different inputs. Although I made some great progress using this chip, I found a few SMT ICS501 ICs in my junk box and decided to give them a try. I was impressed how easy it was to use! I just fed it 5V and my clock signal, and it output 8x my clock signal! Since I don’t have my 10MHz reference frequency running at the moment, I tested it with a 1MHz canned oscillator. It worked great, and was so easy! I’ll definitely be using this chip to multiply-up crystal oscillator frequencies to improve the precision of frequency counting. The pin connections are straightforward: +5V and GND to pins 2 and 3, no connection for pins 7 and 8, clock goes in 1 and comes out on 5. Pins 4 and 6 are both set to +5V to yield a x8 multiplier, according to the chart. All of this is in the datasheet for the chip. The IC I had on hand was SOIC. I don’t think they make this IC in DIP. Luckily, I have breadboardable breakout boards on hand. These breakout boards are identical to those sold on dipmicro but I got mine from ebay and they’re all over ebay!